A blog about Northeast energy issues, and in support of nuclear power. Since the NRC has the sole responsibility for regulating nuclear safety, the legislature of the state of Vermont had to judge Vermont Yankee on some other grounds. They chose "reliability." Is the plant reliable? States are generally able to license or not-license power plants on the basis of their cost and reliability. Since Vermont Yankee has one of the highest capacity factors among its sister plants nationwide, and was doing a 530 day breaker-to-breaker run at the time, the legislature was kind of in a quandary. How to shut down a reliable plant on the basis of reliability? Wink-wink, nod-nod. I have sat in many hearings where the legislators talk in fearful terms about tritium leaks, soil near a leak containing strontium (which will attack the bones of our children), a cooling tower collapse. None of these incidents caused the plant to go off-line. None of these were reliability issues. The legislators would then turn to the audience and said: "Of course, we can't use the s-word (safety)." After a smile and a nod to the audience (they actually didn't wink), the legislators would go right back to why the plant had to be shut down for the safety of Vermont residents. All the issues they were talking about did not affect the reliability of the plant, and the NRC assessed them as posing no danger to the public (safety). Note: The strontium-contaminated soil near the leak was taken to a radiological waste disposal site. It was about two pick-up truck loads worth of soil, according to plant spokesmen at the time. The issue of Vermont's pre-emption of the NRC obligation to regulate plant and regulatory safety is a major contention of the Entergy lawsuit. I wrote a blog post about State's Rights and the NRC: it was posted at the ANS Nuclear Cafe site today. The ANS site gets high volumes of traffic, compared to my own blog. Please visit! 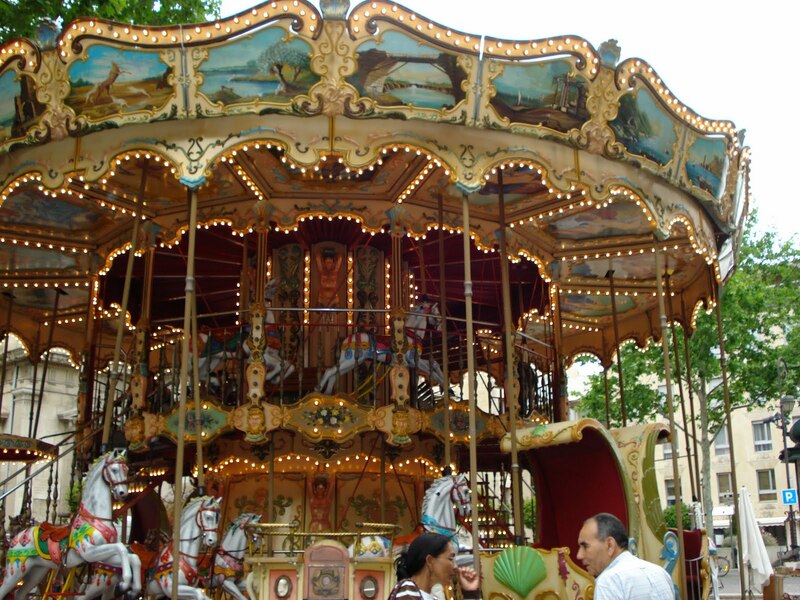 I am delighted to be the host for this week's Blog Carnival. 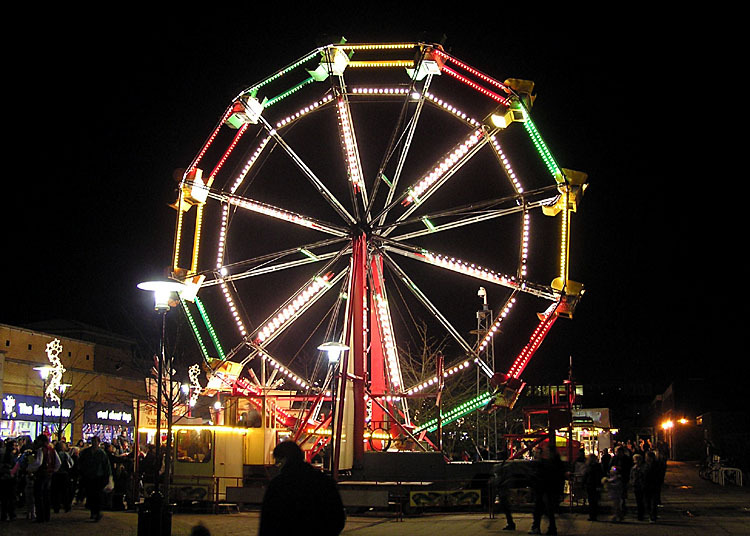 The Carnival is a true extravaganza of information, commentary, and even wisdom about fear of radiation. We'll start there. In a first for the ANS Nuclear Cafe, four contributing bloggers do a group post on this subject. They ask whether improvements are needed in explaining the significance of the numbers to the public. The answer, as an outgrowth of media and public confusion related to the ongoing Fukushima crisis, appears to be a resounding "yes." The contributors are Stewart Brand, ecologist; Cheryl Rofer, chemist; Steve Aplin, management consultant, and Mimi Limbach, public relations executive. Dan Yurman of Idaho Samizdat pulled the group together and wrote the introduction. This post is a reprint of a 1998 paper written by Ted Rockwell. In light of the reminders of the 25th anniversary of Chernobyl - with outrageous claims of long term health effects - and the continued confusion about the evacuation zone around Fukushima it seemed important to share this work more widely. Radiation is something to be understood, not something to be feared. Its health effects have been widely and extensively studied for more than a century. About a month ago, Brian Wang wrote an excellent post on deaths per TWh for different energy technologies. In these week's post, he notes that even Greenpeace is quoting his earlier post. With careful research and honesty, pro-nuclear bloggers are shaping the energy debate. In this post, Gail Marcus looks at the future of regulation and research after Fukushima. Emphasis will probably shift to research and regulation about the systems that led to the accident (back-up generation and fuel storage), but research on non-traditional nuclear designs will also get a boost. Pebble Bed reactors, for example do not use water for cooling. At Next Big Future, Brian Wang hosts a guest post by Chris Phoenix. 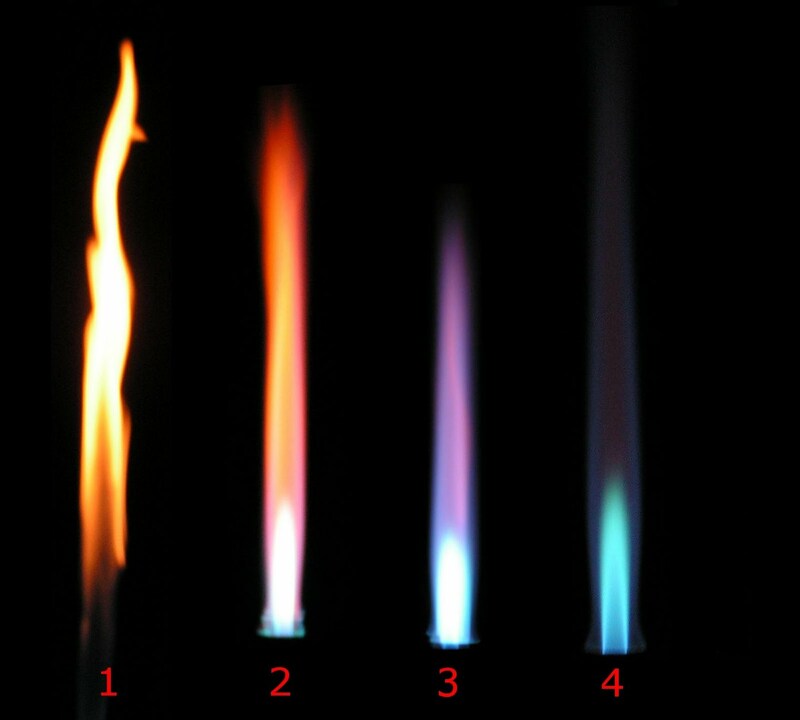 The usual explanation for the explosion at reactor 4 is a hydrogen explosion, but Phoenix argues for a steam geyser from an overheated fuel pool. At Cool Hand Nuke, Jeff Madison hosts a guest post by Dan Yurman on the probable effect of Fukushima on new builds in the United States. The South Texas Project will affected by TEPCO issues (TEPCO was one of the backers for that project). Most other projects in the United States are unlikely to be affected. Brian Wang notes that the Fukushima reactor emergency will continue for another 6-9 months before TEPCO will be able to get to a cold shutdown. Several posts describe nuclear energy prospects for the future, and how people in the field look at their chosen profession. Canadian Energy Issues hosts a guest post by Donald Jones. Ontario’s power system could be entirely and economically fossil-free by 2045. For this to happen, all nuclear refurbishments and new build must ensure load-following and -cycling. According to retired nuclear industry engineer Donald Jones, it is possible to refurbish the Darlington and Bruce B CANDUs so that they can load-follow and -cycle. And ALL new nuclear must have this capability. It remains to be seen if the province has the political will to make it happen. NEI Nuclear Notes goes after Cleantechnica and the Worldwatch Institute for the claim that renewables surpassed nuclear in 2010. It's that old game again: installed-capacity for renewables is definitely high. But power-produced for renewables is low. On her 4 Factor Consulting blog, Margaret Harding tells the story of one woman's journey into nuclear energy. I may be a "shill for the industry" but I am a nuclear engineer and proud of that fact. I believe that nuclear energy is clean and green. Fukushima has done nothing to change that. I give an overview of the lawsuit Entergy filed against the State of Vermont. 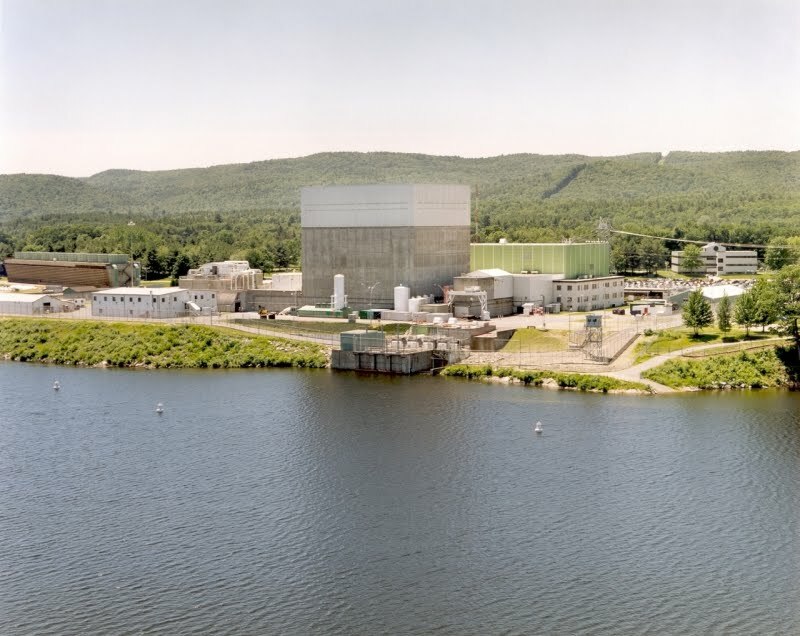 Vermont is attempting to shut down Entergy's Vermont Yankee power plant, despite the fact that the NRC recently extended its operating license for twenty years. The Entergy suit hinges on breach of contract and federal pre-emption of the regulatory powers of the NRC. I also have several follow-up posts exploring different aspects of the lawsuit, for example, Entergy and Vermont Part 1: Act 160. More posts to come, of course. Dan Yurman at Idaho Samizdat reports that International Isotopes on track for NRC license in 2011 for uranium deconversion and fluorine extraction facility. The firm has applied for a DOE loan of $97 million for a $125 million plant to be built in Hobbs, NM, just a few miles from Urenco’s newly operational uranium enrichment plant. Charles Barton points to many parallels between the ideas of Energy writer Kurt Cobb, and Nuclear Green. The primary difference is that Nuclear Green is far less pessimistic about the future of Molten Salt Reactor technology. Brian Wang examines the steady progress Lawrenceville Plasma Physics (LPP) is making toward nuclear fusion. LPP is solving one problem at a time, and Brian describes their latest advance. Please post a Tweet, a Facebook entry, or a link on your Web site or blog to support the carnival. Also, please post it to Stumbleupon and Digg if you can. Share this intellectual sustenance with a wider group! Yesterday morning, Entergy filed for an injunction in federal court. Entergy asked that the state be enjoined against shutting down Vermont Yankee while lawsuits and appeals were pending. This was a predictable move in many lawsuits. Without an injunction against taking action, one side wins without a trial. You can imagine: "The renters sued me, so I will kick them out right now!" That sort of thing. Update: Terri Hallenbeck of the Burlington Free Press has a well-written story about the filing, with more details. According to a April 6 article by Bob Audette in the Brattleboro Reformer (the article is behind a paywall now) a report by Jefferies, an investment advisory company, predicted the plant would run beyond the March 2012 cut-off date. A quote from the report: "We believe it is presumptuous to assume that the plant will be shut down or that Entergy would lose the lawsuit." Also yesterday, Governor Peter Shumlin gave a press conference. True North Reports has an excellent blog post about his press conference. In the conference, Shumlin repeated his claim that Entergy supported Act 160. Further, he claims that he himself had never discussed the safety of the plant, just the reliability. In the well-edited True North video that heads this post, most of the video time is given to Shumlin's answers at that conference. The Entergy lawsuit is a story that will play out over time. Instead of attempting to look forward very far, I thought I would look around a bit at the issues, and even look backward. The second of a series of posts. Entergy filed a lawsuit to keep Vermont Yankee open, as I described in previous posts. Of course, Shumlin vowed to fight the lawsuit. Aside: If you read the title of Shumlin's press release, you will note that Shumlin thinks Vermont is being sued by Entergy Louisiana, a transmission and distribution utility that serves the Gulf States. Discussing that fact would be a different blog post. End Aside. Attorney General Bill Sorrell said his office has been preparing for well over a month for the possibility that either Entergy would be suing the state or it would continue operating the plant, forcing the state to sue Entergy. "We've known this was going to end up in court," he said. "The governor authorized us to get more resources, both in staffing and expert witnesses. We've got a lot of work to do, but we're not scrambling woefully behind." In the past, Shumlin had infinite resources to fight Vermont Yankee. He pulled resources from "The Bank of Entergy". Yes, Entergy paid the costs for Shumlin to fight Entergy. By law, Entergy is required to pay all the expenses involved in its application for a Certificate of Public Good. For example, when the legislature wanted a Public Oversight Panel, the panel was authorized, and the panelists were paid at $300 an hour each. This was no expense to the state, and no problem for Shumlin. These costs were passed on to Entergy. Here's a link to one of the Vermont contracts about Vermont Yankee. This contract is with Fairewinds, Arnie Gundersen's company. This isn't a contract for the Public Oversight Panel; it's a contract for the Joint Fiscal Office. On page 2, you can see the billable rate as $185/hour. At the top of attachment A, you can see that the "expenses shall be allocated" to the "company or companies involved in those proceedings" (that is, to Entergy). The compensation was set jointly as per the statute by, "the speaker of the house, the president pro tempore of the senate, and the secretary of administration." Act 189 at Sec. 8. You are correct the compensation was set at $300 per hour for the POP members. David Lochbaum only accepted his expenses and not any hourly compensation. The costs were billed-back to Entergy as per the statutory language of Act 189 which stated, "The compensation and costs incurred by the public oversight panel shall be charged to the petitioner for a license extension under the provision of 30 V.S.A. 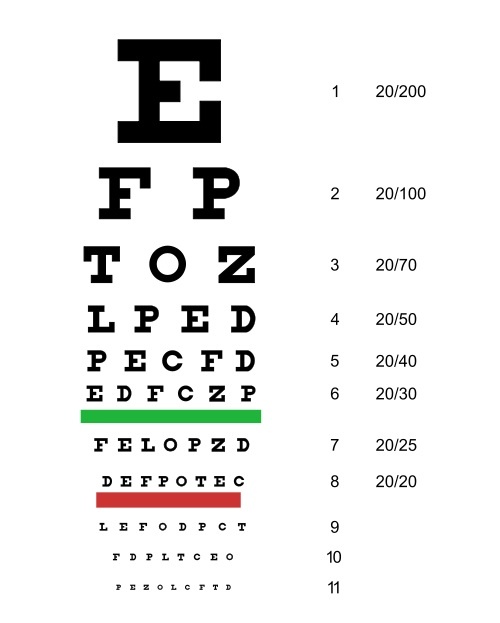 §§ 20 and 21.” Act 189, Section 9. In other words, when the Joint Fiscal Office set a price for Gundersen's services, it was $185/hour. When legislators, including Shumlin as President Pro Tem, set a price for Gundersen's services, it was $300/hour. In either case, they were spending Entergy's money. As far as I can tell, from Shumlin's point of view, Entergy supplied as much money as Shumlin wanted, as long as Shumlin could say the costs related to Entergy's request for the Certificate of Public Good. Now, Entergy is suing Vermont, and the state will have to pay for its own expert witnesses and lawyers. Shumlin has authorized "more resources" for the fight. What will be the cost of these "more resources"? Will the lawyers and expert witnesses be paid as they were on the oversight panels during the hearings? Despite which way the federal judge rules, Sorrell said he expected the case to wend its way to the federal appeals court in New York City and most likely to the U.S. Supreme Court. "I would be shocked if the litigation ended in district court," he said. How much is this defense expected to cost? Is it budgeted? How much outside expertise will be required to be hired? Had this matter been directed to the Public Service Board, would the costs of that process incurred by the state be billed back to Entergy? Ready for Battle: The Future? 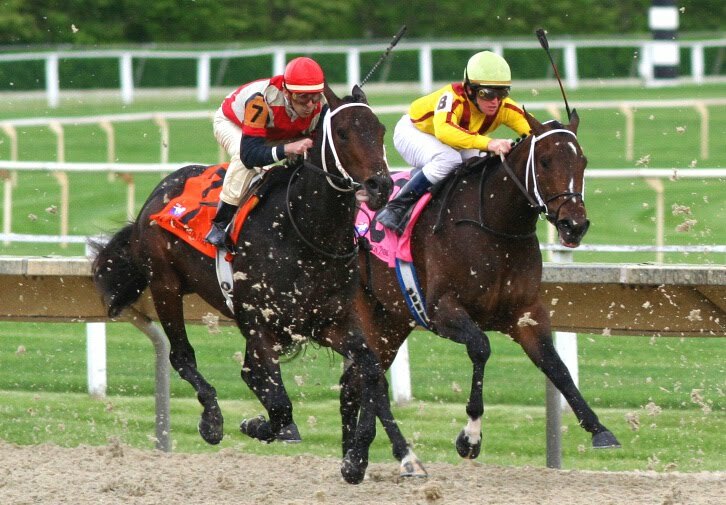 Every lawsuit is a horse race, to some extent. You don't know who won until it's over. All to close down Vermont Yankee. We only have 600,000 people in Vermont. I don't think they are going to be eager to support these millions or tens of millions of dollars. Right now, teachers are being laid off, highway funds are being cut, the state has troubles. The budget deficit is about a hundred million dollars. Shumlin has said "no new taxes" but he plans to raise over twenty million by taxing medical providers and dentists. This is not making anyone happy. It's a bad time to "authorize resources" for a court battle to shut down a major employer. I don't think Shumlin really understands that the game has changed. The "Bank of Entergy" is closed to him. It was open for years, after all, and paid promptly for anything related to the Certificate for Public Good. But now there's a lawsuit, not a procedure before the Public Service Board. Now, Shumlin can't do whatever he wants and bill it to Entergy. His only source of funding right now is the taxpayer. Shumlin may be about to have a learning experience. Note about the budget deficit in Vermont. For a while I read $120 million. Then it was $100 million. My newspaper this a.m. says $176 million. Anyhow, it's big for a state of 600K people. We don't need to add to it by arguing complex cases up to the Supreme Court, especially when "winning" Vermont's case would mean shutting down a major employer and taxpayer. The Entergy lawsuit is a story that will play out over time. Instead of attempting to look forward very far, I thought I would look around a bit at the issues, and even look backward. This is the first of a series of posts. One of the important points in the Entergy lawsuit is the claim that the State of Vermont changed the Memorandum of Understanding (MOU) by passing Act 160. Entergy signed the MOU when it bought Vermont Yankee in 2002. In the MOU, Entergy agreed that it would require a Certificate of Public Good (CPG) from the Public Service Board to continue operating the plant past 2012. In 2006, the legislature enacted Act 160, saying the Public Service Board could not grant a CPG without legislative approval. This Act was a material change to an already-signed contract. Act 160 took the authorization of continued operation from the hands of the Public Service Board, and gave it to the legislature. Snarky anonymous emails to this blog, statements by staff of the New England Coalition, statements by long-term opponents of Vermont Yankee in the legislature--the opponents claim the same thing: "Entergy supported Act 160! How can they fight it now?" Well, Entergy didn't support Act 160. They didn't fight it actively, but they didn't support it. Entergy officials also complained that the bill would be redundant when paired with last year’s action. “That just seems excessive,” said spokesman Brian Cosgrove. “I think the Legislature already has a major role in license extension. There’s no way Vermont Yankee can continue to operate beyond 2012 without the Legislature’s approval for dry cask storage"
Entergy did not support Act 160. I suppose Entergy might have fought it, if they had possessed a crystal ball to the future. They apparently did not fight it. On the other hand, they did not support it. Anybody who says Entergy supported Act 160 is either mis-informed or has some evidence that I could not find. Note: The newspaper record from 2006 about Act 160 is not available on-line. I obtained some pdfs of old newspapers from the library. If you think Entergy supported Act 160, please send me your evidence. If you want to research the issue, you can go to your local library and look for microfilms of newspapers from around March 15, 2006. If you can find any statement by an Entergy spokesperson supporting Act 160, please send me a copy of the article. Thank you. This morning, Entergy filed suit to keep the plant open by requiring Vermont to honor its signed contracts. The State of Vermont signed a Memorandum of Understanding with Entergy in 2002. The State has attempted to amend that contract on a one-sided basis. Entergy's lawsuit was described in a Burlington Free Press article this morning. You can also download the filed lawsuit here. According to the Memorandum of Understanding (page 6) the parties "espressly and irrevocably decree that the Board (Public Service Board) (1) has jurisdiction under current law to grant or deny approval of operation of VYNPS beyond March 12, 2011." However, in 2006, the legislature voted that the PSB could not issue such a certificate without legislative approval (Act 160). This was basically a one-sided change to a written contract. There are tons of precedents that one side cannot change a contract without the other side's approval. Let's see the list of such precedents. There's the Parol Evidence Rule for ordinary contracts. The written contract is the ruling document. Finally, there's the U.S. Constitution. According to Article 1, Section 10, no state shall pass any Bill of Attainder, ex post facto Law, or Law impairing the Obligation of Contracts. According the the Vermont Yankee press release, there are further precedents, not closely related to Act 160. (Note, the precedents cited above are my opinions, not taken from Entergy documents.) Here's a quote from the Entergy press release about some nuclear and interstate commerce law precedents. Atomic Energy Act Preemption. Under the Supremacy Clause of the U.S Constitution, the U.S. Supreme Court held in 1983 in a case involving Pacific Gas & Electric that a state has no authority over (1) nuclear power plant licensing and operations or (2) the radiological safety of a nuclear power plant. In violation of these legal principles, Vermont has asserted that it can shut down a federally licensed and operating nuclear power plant, and that it can regulate the plant based upon Vermont’s safety concerns. Federal Power Act Preemption and the Commerce Clause of the U.S. Constitution. Vermont is prohibited from conditioning post-March 2012 operation of the Vermont Yankee Station on the plant’s agreement to provide power to Vermont utilities at preferential wholesale rates. The Federal Power Act preempts any state interference with the Federal Energy Regulatory Commission’s exclusive regulation of rates in the wholesale power market. The Commerce Clause of the U.S. Constitution bars a state from discriminatory regulation of private markets that favors in-state over out-of-state residents. Not surprisingly, it comes down to Shumlin again. In a meeting with Entergy representatives on March 30, 2011, the governor reiterated his firm opposition to the operation of Vermont Yankee after March 21, 2012. Ah well. At least he's consistent, I suppose. He campaigned against Vermont Yankee, and he was losing. Then he began campaigning on reproductive rights and healthcare and sneaked to victory. Was I Behind the Curve on This? Sometimes, I think I am the last person to know these things. 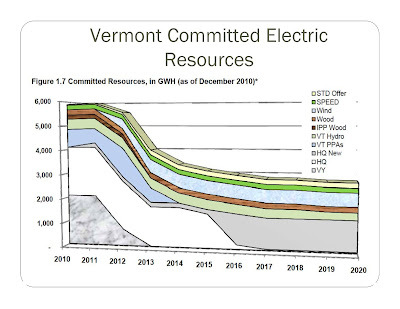 Do you remember this chart of Vermont's Committed Resources that I put in my blog about a week ago? The chart comes from a Department of Public Service presentation from March of this year. Note that Vermont Yankee electricity supply doesn't end on March 21, 2012, but continues for a while. If there's a lawsuit, the plant can almost certainly keep running while the suit continues. Why didn't I notice this aspect of the chart before? Update: Joffan is quite right in his comment. This chart shows VY supplying similar amounts of power in 2010 and 2011, one-fourth that amount of power in 2012, and no power in 2013. I misread it. However, I am going to leave the chart in place because it shows how Vermont depends on Vermont Yankee (2000 out of 6000 GWh) and what a big gap would need to be filled. The 48th Carnival of Nuclear Energy Blogs has been assembled by Dan Yurman and hosted at ANS Nuclear Cafe. As you might expect, Fukushima is the main topic. As a matter of fact, I even blogged about Fukushima instead of Vermont Yankee! Rod Adams points out that as Fukushima moves from an INES 5 to a 7...zero is still a relevant number. That's the number of deaths to date. Charles Barton at Nuclear Green discusses Chernobyl, and inherent safety features of the proposed Molten Salt reactor. Idaho Samizdat describes the work of decommissioning Fukushima, and includes a guest post from Jacques Besnainou, CEO of Areva Inc., on the poor reporting and half-truths about MOX fuel. At Next Big Future, Brian Wang discusses the INES numbering system, and the non-story of INES 7. NEI describes nuclear workers in Japan and the U.S., referencing a New York Times story about ignorant farmers being hired to work in Japanese nuclear plants. Well, it's not that simple, really. Gail Marcus at Nuke Power Talk describes the need for all sorts of energy. Idaho National Lab has a video on nuclear safety. ANS Nuclear Cafe features information on how the ANS Social Media list helped support accurate reporting, and also how new types of outreach are changing the conversation. The first post is by Margaret Harding, and the second by Suzanne Hobbs. As I mentioned before, I also have a post about the evolution of our understanding of Fukushima at Yes Vermont Yankee. Also listed in the Carnival, Nuclear Street has amazing pictures of the water line at Fukushima. Worth a look! I will be offline for two or three days, visiting family for Passover. I wish a good week to all my readers, and a good holiday to those also celebrating Pesach. Trying to understand what is going on at Fukushima has not been an easy task. Even after the first weeks, information out of Japan was hard to parse. 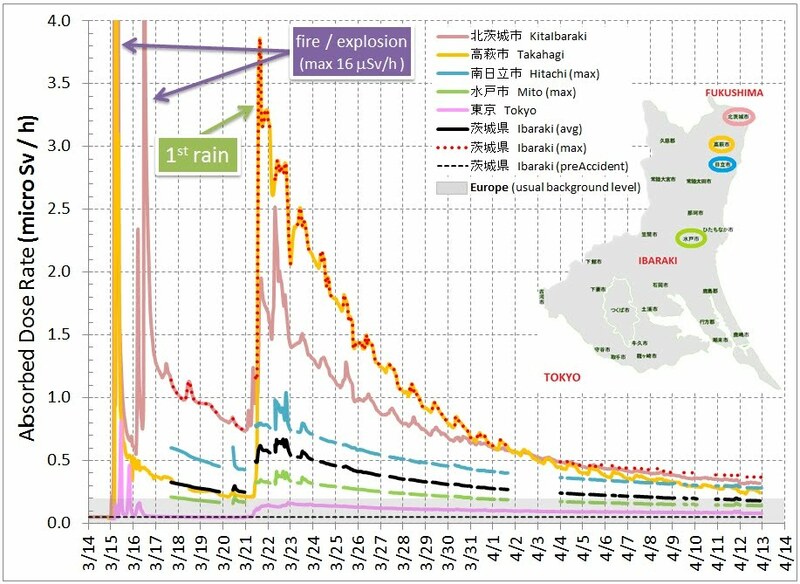 For example, on April 4, the Capacity Factor blog attempted to understand inconsistent radiation readings in Japan, while on March 27, Cheryl Rofer blogged about the ways radiation measurements could go wrong. Then there was the entire "tellurium shows there is re-criticality" business. 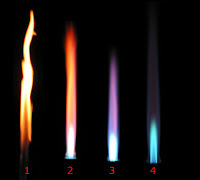 First, the Japanese reported the presence of tellurium in a water sample. Second, Arnie Gundersen and others were quick to claim that this proved the reactors had "gone critical" again with a fission chain-reaction. Third, the Japanese admitted that their measurement was wrong: there was no tellurium present. The measurement was wrong and Gundersen's re-criticality theory was wrong, too. In other words, we had a complete lack of clarity. There's a scale, the INES scale, for nuclear accidents. On this scale, Three Mile Island was a 5, and Chernobyl was a 7. 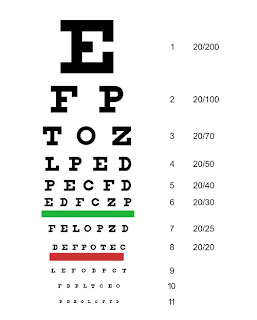 Seven is the highest level on the scale. Until April 11, the Fukushima accident level was assigned as a level 5, the same as Three Mile Island (TMI). That was obviously too low an assignment: nobody was evacuated or burned by radioactive water at TMI. Then the Fukushima level was raised to a 7, the highest level possible. Fukushima has only emitted 1/10th the radiation that Chernobyl did. (Also, unlike Chernobyl, nobody has been killed by radiation at Fukushima.) 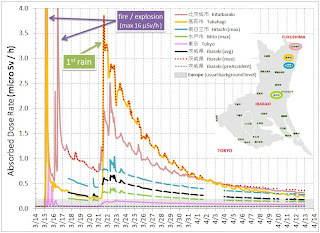 Capacity Factor has an excellent post comparing Fukushima level 7 with Chernobyl level 7. So, the INES scale has the same rank (7) for two accidents that are an order of magnitude apart in terms of radiation release. However, what about a bigger-than-Chernobyl accident? A two-reactor Chernobyl? That would be an INES 7 also. Luckily, in recent days, some clarity has come to general understanding of the Japanese situation. We first moved from complexity to oversimplification, and now we are approaching knowledge. A wonderful interactive graphic from the New York Times puts many types of earthquake damage on the same graphic (finally!) in a move that Edward Tufte would appreciate. becomes a dosage at which long-term health effects become more likely. Furthermore, in the Radiation tab of the Times graphic, there is a slider under View Readings Each Day. If you move the slider to March 17 and then move it forward in time, you can see the overall radiation levels decrease with time. The colors of the dots become less intense. It's a great visual and shows that the radiation is getting under control. Airborne radiation levels are diminishing. This makes sense, because most of the radiation was released in the early days of the accident. There's another good source if you want to see the time evolution more directly. The NEI (Nuclear Energy Institute) blog linked to a new graphical blog based on Japanese data sources. This blog has graphs of the main parameters of the reactors over time on one set of charts. For our purposes, another set of charts is more interesting: these charts map the evolution of the radiation levels in Ibaraki prefecture and Tokyo, with a comparison to European background levels. Once again, the charts show the same clear story of steadily decreasing radiation levels. Radiation spikes at the beginning of the accident, then steady decreases.I have grabbed one of these charts below. As usual, double-click to enlarge it. Final clarity is not available yet. Power has been restored to the Fukushima site, radiation levels off-site are decreasing, the major radiation outflow from the plants now is water, which is intrinsically easier to control than air-borne emissions. But nobody would say that the problems are over. Fukushima isn't Chernobyl, and it isn't Chernobyl on steroids (as Gundersen predicted) but it is serious. This Fox news clip is not particularly upbeat, but I think it is a good summary of the situation to date. The graphic at the top of this post is a picture of a snubber at Brown's Ferry. Brown's Ferry is a sister plant of Fukushima and Vermont Yankee. 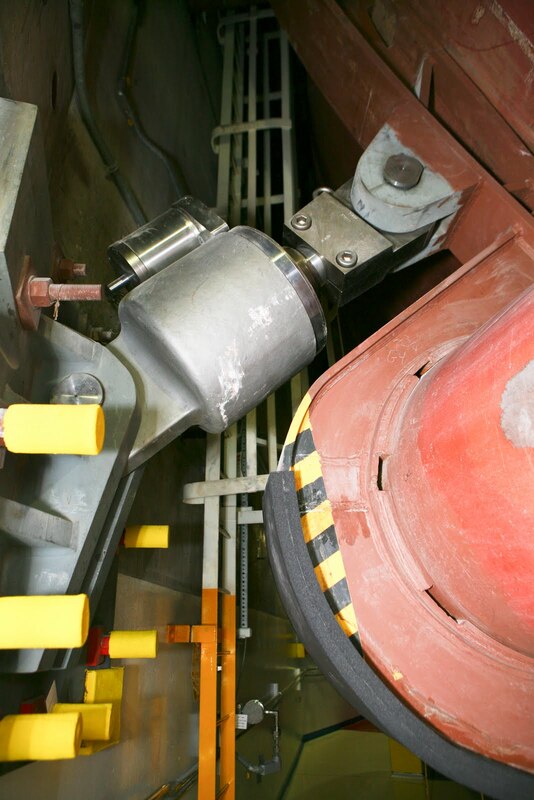 The snubber is isolates vibrations for Unit 1 and is part of the seismic activity safety equipment for the plant. Photo used with permission of TVA. The Forty-seventh Carnival of Nuclear Energy Blogs is up at Cool Hand Nuke. Jeff Madison did a great job of pulling those blogs together. As the situation in Japan becomes more stable, Cool Hand Nuke reports on how it will affect new builds in the U S. It won't affect them much. Brian Wang of Next Big Future looks at the statistics of radiation survivors, including Hiroshima and Nagasaki, and puts the current situation at the Japanese reactors in perspective. It is most probable that very few (or no) premature deaths will result from the situation in Japan. Corroborating this, Steve Aplin of Canadian Energy Issues points out: "When the prospect of a single nuclear fatality is judged more newsworthy that the plight of half a million people in an unprecedented natural disaster, something is seriously wrong in the editorial rooms." (Emphasis added by blogger). Gail Marcus of Nuke Power Talk describes TVA's Brown's Ferry plant, and how it is different from Fukushima. Personally, I think of these reactors as similar houses in a subdivision: when they are built, they all look alike. After thirty years of modifications by the owners, there are significant differences between them. Kudos to Gail Marcus and to Matt Wald of the New York Times for pointing out the modifications. Also, kudos to TVA for opening their plant to the media. If you remember, I embedded the video of the Brown's Ferry tour on this blog. For a full perspective on Japan, we must also look at the financial and society costs of the reactor damage. Dan Yurman looks closely at lessons learned from TMI in his post on "Decommissioning Fukushima" on the ANS blog. At Idaho Samizdat, Yurman breaks a story about a confidential government report about Fukushima. Yurman also links to the report. Read his post and read all about it! The nuclear opponents are quite busy at this time, and Charles Barton of Nuclear Green describes the strategies that George Monbiot used to discredit Helen Caldicott. Caldicott doesn't have evidence to back up her claims, and Barton describes Monbiot's effective method of just keep asking for the evidence. "Just the facts, ma'am. You can skip the hyperbole for now." Pro-nuclear activists have to just keep asking. Meanwhile, in Vermont, I concentrate on---Vermont. My post on the Carnival is about Vermont utilities and Vermont Yankee. Isn't it interesting that GazMetro (aka Green Mountain Power) is a major utility buying power from Vermont Yankee, but has a serious conflict of interest in selling power from Vermont Yankee? It would definitely rather sell Canadian gas to power plants. 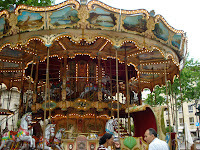 And here's a link to a post that went up today, and is not on the Carnival. In View From Vermont at ANS Nuclear Cafe, Howard Shaffer says that The More Things Change, The More They Stay the Same. Howard and I have been in several public forums (debates, club meetings) where we have presented material about Fukushima. After our presentations, nobody asks questions about Japan. The opponents attempt to convince the audience that "This is going to happen in Vermont, probably tomorrow!" Most people aren't interested. As one woman said to me after a debate: "You wasted your time talking about Japan. It's a long way away. We want to know about Vermont." We get questions about tritium leaks, costs, whether Entergy lied under oath, what will happen with the spent fuel that is stored on site. In other words, the same questions. The more things change, the more they stay the same. All politics is local, and so are all nuclear plants. Utilities in Vermont: Whom Do They Serve? In a previous blog post, I described the flap that ensued when Entergy announced that they had completed negotiations with Vermont Electric Cooperative (VEC). Entergy made this announcement before the VEC board had approved the contract. I suggested that the announcement wasn't about the VEC deal as much as it was about signalling other utilities that Vermont Yankee would sell power below market rates. Who were these other utilities? There are two big utilities in Vermont: Central Vermont Public Service (CVPS) and Green Mountain Power (GMP). These utilities basically provide transmission and distribution services, and are regulated by the Public Service Board. About two years ago, I attended a hearing about Vermont Yankee at one of the legislative committees. GMP and CVPS representatives testified. The legislators asked the GMP and CVPS representatives what would happen if Vermont Yankee would go on a prolonged outage before March 2012? The utilities answered they carried "outage insurance" (for unexpected outages) on Vermont Yankee, and they would use this insurance to pay the differential between Yankee rates and grid rates. However, the insurance covered only a fixed time. If Vermont Yankee stayed off-line for a longer period, the utilities would have to appeal to the Public Service Board for "emergency rate relief." They would ask the Public Service Board for permission to raise rates to their customers, with very little warning. I expect such a request for rate relief would have been granted. Since the Public Service Board can give rate relief to the utilities, the utilities do not have to worry overmuch about being squeezed between high-cost providers and low-paying customers. Consequently, the utilities do not have a bottom-line requirement to get the cheapest rates possible. However, the utilities are supervised by the Public Service Board, and the Board has the best interests of the ratepayers at heart. At least, I hope so. "We concluded that there were four conditions if we were to sign a deal: NRC approval of relicensing; the sale of the plant to a new owner; an agreement for Entergy to sell 20 megawatts in Vermont in addition to sales to CV and GMP; and state approval of the decommissioning and any other issues of interest to the state...It has been our position that we would not enter into a formal contract absent a sale and tacit state approval of any proposed deal." I have been following the story of Vermont Yankee pretty closely, and this is the first time I had heard of CVPS saying that Entergy needed to sell the plant before CVPS would buy power from it, or that Entergy needed to sell 20 MW in Vermont to groups besides CVPS and GMP. If anyone can tell me an earlier time these requirements were announced, I would be grateful. I had heard that CVPS and GMP preferred if the plant had another owner, but not that CVPS required the sale before buying power. In my opinion, by stating that "we won't buy from THAT company, no matter how cheap and reliable the power is" CVPS is abandoning their duty to obtain low-priced reliable power for ratepayers. On the other hand "we won't buy" is exactly what I would have expected to hear from Green Mountain Power. After all, they are a wholly-owned subsidiary of a Canadian gas company, GazMetro. Governor Shumlin wants to close Vermont Yankee, but he strongly supports wind turbines and the expansion of natural gas pipelines into Vermont. 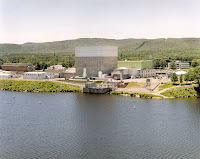 Green Mountain Power's parent company will undoubtedly make more money from selling Canadian gas to Vermont than Green Mountain Power would make by selling less-expensive Vermont Yankee power to Vermont. By the way, while it was relatively easy to find a "we will not buy from Entergy" quote from the president of CVPS, I have not been able to find an equivalent "we will not buy" quote from the president of Green Mountain Power. However, I saw an email from the president of GMP which said GMP had found other sources of power through 2016. If the Entergy press release was signaling low prices to Vermont utilities, the utility statements above make it clear that Vermont utilities don't care about low prices. Maybe they get granted "rate relief" a little too easily? In an investor conference call on February 08, 2011, Entergy's CEO, Wayne Leonard, made these comments: Efforts also continue to secure a new power purchase agreement with the Vermont Utilities. Negotiations had been ongoing for some time now, and we have made progress toward reaching agreement on key terms and conditions that would provide citizens of Vermont continued access to clean and affordable power. However, while we would certainly prefer to sell power in state, that is not a necessary condition, of course. None of this is good for Vermont. Utilities that don't care about price. A big in-state provider that is looking out-of-state for customers. 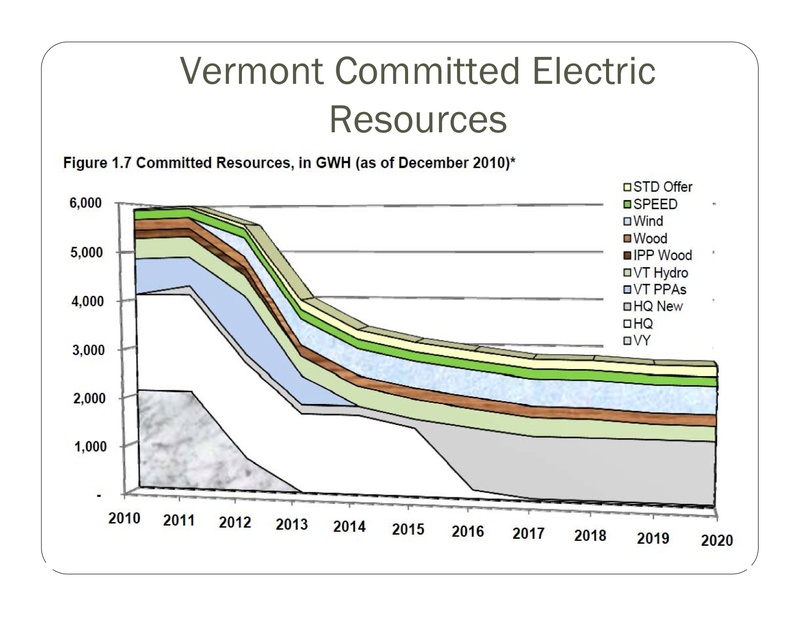 I think the Vermont legislature has now put Vermont rate-payers in the odd position that even if the plant continues to operate, people in Vermont will not get the financial benefits of the low-cost power. On March 30, Entergy announced that it had finished negotiations on a contract with Vermont Electric Cooperative. The title of the Entergy press release was Entergy, Vermont Electric Cooperative Complete Negotiations on Power Contract and the first two paragraphs of the press release were as follows (emphasis added by blogger). NEW ORLEANS, March 30, 2011 /PRNewswire/ -- Entergy Corporation (NYSE: ETR) today announced Entergy Nuclear Vermont Yankee, LLC has completed negotiations on a 20-year agreement to sell power from the Vermont Yankee nuclear plant to customers of Vermont Electric Cooperative, Inc., the third-largest electric distribution utility in Vermont. The agreement is subject to approval by VEC's board of directors, and is contingent on the plant running after March 2012. I added the emphasis, but even without this addition, you could hardly say that Entergy was hiding the fact that they had completed negotiations on contract terms (if we get a contract, it will look like this) and there were still major hurdles before the agreement became a contract. These are the first sentences of the press release, designed to be the nut graph of any article based on the release. VEC's CEO David Hallquist said Entergy's press release was "misleading," noting there is "no agreement." VEC presently purchases 10 megawatts of power from Entergy at a much higher prices than contemplated in the deal. "Even with this as a backdrop, the VEC Board of Directors is struggling with any decision to take power from Entergy after 2012, even if Vermont agrees to allow Entergy to operate," said Hallquist in a statement. "A number of the VEC Board of Directors have voiced concern with Entergy's poor relationship with Vermont, the fact that the Fukushima reactor in Japan is the same design, and there is one million pounds of radioactive waste at VY with no plans on what to do with it. The VEC's board will take up this contract again at its April 26 meeting, and it will likely be a topic at VEC's annual meeting in May, added Hallquist. Also, as noted in the Rutland Herald, reprinted in Boston.com, (the Herald is behind a paywall) Despite the favorable rate, David Hallquist, VEC's chief executive, said he did not believe the utility's board would accept the deal with Entergy. He said the board was concerned that Vermont Yankee shares the same design as the stricken plants in Japan. "That is really causing some stress to our board," Hallquist said. Okay, that seems pretty clear. As I noted above, the press release was reasonably straightforward. It was optimistic, but press releases usually are optimistic: "We completed THIS, though there is still THAT to do." Still, the VEC board felt slighted that the deal was announced before they had voted to finalize it. The board may not choose to finalize the deal. So why did Entergy announce the deal early? Why didn't they wait until after the VEC board meeting? I can only guess, and I have no inside knowledge. Most people will probably assume this press release was Entergy once again shooting themselves in the foot about communications. I don't agree. I think Entergy is signalling. Signalling can be sort of fancy word for advertising. However, advertising is often comparatively simple: "Strawberries now available at $2.50 a quart." Signalling can be much subtler. For example, a potential employee shows his dedication to his career by going to night school, therefore "signalling" to the potential employer that he will be a very good employee. In my opinion, this press release signals: Entergy Vermont Yankee intends to be open for business after March 2012, and they are willing to give very good power purchase agreement rates. A signal can be a complex thing. For example, the employee going to night school may or may not be learning a skill that helps him be a better employee. It's not about the skill or even the school. It's about the signal his activity gives to potential employers. Similarly, I think that the question of why Entergy sent this press release at this time cannot be answered by looking at Entergy's relationship with VEC. This press release is a signal to a wider market. Also, this is an upbeat way of signalling: we're ready to sell power to a buyer! If the VEC board turns down the agreement later this month, Entergy's signal would not be as effective. Whether the VEC board signs the agreement or turns it down, Entergy sent the signal it chose to send. As I said before, it's about the signal, not about Entergy and VEC. I don't know if this type of signalling will be effective in helping Vermont Yankee be relicensed. However, advertising a low power price can't hurt. Utilities who ignore this signal will have to justify to their rate-payers why they aren't interested in low-cost power. Do We Need Vermont Yankee in Vermont? There's a big gap in power supply on that chart. There's a lot of open space between 4000 and 6000 GWh after 2012. The electricity that isn't there would need to be made up with "grid purchases" at whatever price is on offer. Vermont Yankee raised the stakes with this signal that they are willing to sell power at below market rates. Now the people in Vermont know what is at stake, and what it will mean if Vermont Yankee is voted off the island. The 46th Carnival of Nuclear Energy Blogs is now up at Next Big Future. It is a magnificent Carnival, because the bloggers are finally finding out enough about Japan to write some great posts. This Carnival could be called: Recent Information in Perspective. Probabilistic Risk Assessment:invented in America, it should probably be used more in Japan. This is one GREAT Carnival, and thanks to Brian Wang for assembling it! I put up a post last night with a video of a tour of the Waterford nuclear plant. The Today Show toured this Entergy-owned plant, which has successfully weathered hurricanes. However, the TV show took the video down, and my embedding failed. So I deleted my blog post. If you got an email alert about a blog post named "Waterford" and now you can't find the post, that's the reason. Tax Day. Thank the Rich! Friday Matinee – Double Feature! Fukushima, radiation, fish, and you! A response to John Quiggin - his misinterpretation of "the burden of proof"
Most graphics on this site are sourced from Wikimedia Commons. Text and graphics (those graphics not from Wikimedia) are copyright Meredith Angwin, 2010-2019, all rights reserved. Statements in this blog are the personal opinions of Meredith Angwin or of a guest blogger. Statements in this blog are not policy statements of any organization.